In my blog post the "First 2 Weeks" I took you up through last Wednesday. I mentioned that Wednesday my throbbing headache was returning B.A.D! Thursday- Uneventful day. Isaac decided the swing is an ok thing! Yippie! Mommy went out with Shonda for about an hour to a open house for a Tastefully Simple open house. Yummy snacks! Daddy did super well with all 3 kiddos!! Friday we took a quick jaunt to see Dr. P for Isaac. I was a bit worried about the healing of his wee-wee (pardon my word choice) and his cord is not drying despite them putting "acid" stuff on it to dry it up. My advice to all new mommies. I don't care what they tell you in the hospital. Use alcohol at each diaper change until it dries & comes off. We did with the first 2 and had no problem. The "new" way now is to do nothing. I'm not impressed with that method. The afternoon came with a dear woman from church coming over to watch sleeping Aidan and baby Isaac while I went in for my quick BP check at my fam Dr. Hahahaha! 3 hours later I came home to relieve Shonda who had taken over for Sue watching the boys. Thanks gals! Even with the prescribed BP meds my BP was at the highest point yet. So, more needles for lab work, doubled my BP meds, received a betablocker med to help with BP and the hypertension headache (a.k.a awful throbbing headache), AND a sono. Why a sono? Well I had mentioned to my Dr. that I was still spotting/bleeding more than I had with the other two. Even to the point of "gushing" when simply picking up the baby. With all my other issues she was not liking the sounds of it and ordered a sono. The sono did show pooling of blood in my endometrium lining. They said it wouldn't fix on it's own and a DNC was mentioned as an option. Oh- Great! Friday we met my parents to take the older 2 kiddos for the weekend. Give me a bit of rest. Saturday Matt was on duty for work and had to do some driving around to stores to evaluate them and to visit with employees. Isaac and I decided to ride along. Isaac slept great as we drove around and I was able to work on my Thank You's and catch some shut eye. Kept me from being at home feeling guilty about my messy house and piles of laundry. About dinner time I was feeling really crummy. I had been having a sharp, shooting pain in my head above my left ear throughout the day in addition to the throbbing. I was a "new" pain and very uncomfortable. Sometimes intense enough to make me "twitch" when it would "shoot". I debated calling the Dr., but didn't until I got home and there was a msg from her asking how I was doing. I found out she was the Dr. on call so I gave her a buzz. Told her about my headache and she sent me to have my BP checked. She advised if it was more than 140/90 she wanted me to head in to the ER. Well a very nice EMT took my pressure and wowzers!! It was 178/118!! Higher yet! AND that was with my BP meds doubled!! So, much to Matt's dismay I believe, we head in to the ER. It really was a fairly short wait. They took my BP and it was a bit lower. Once checked in they gave me an IV pain med. Did nothing...didn't even touch it! Next was another pain med with a narcotic. It was what Matt referred to as the "kick me in the knee so my head doesn't hurt anymore" treatment. SO right! It made me feel as though my brain was burnt, ears about to rupture, oh so dizzy and very ill to my tummy. I laid in a slump crying and questioning what I was doing there. They FINALLY gave me some BP IV meds. Between that and the narcotic I was feeling very tired and the headache was a bit less evident. After about 4-5 hours there we were sent home with my BP meds quadrupled and the beta blocker doubled. Bless Isaac he was a handful there, but slept from 11:30 pm until 4:30 am!! Sunday we took it easy at home. No church. I'm dying to go! To think I went when he was 3-4 days old, but can't at almost 3 weeks! In laws came by after church. Papa held Isaac and cared for him, while my MIL...and this is amazing girls....was allowed by me to do my laundry. While I typically find it very hard to accept help she asked a question that I couldn't lie in answering as evidence was everywhere around the house!! Her question "Do you need any laundry done?" Hahaha! Laundry! It's been enough to attempt to keep the house remotely clean for those coming to visit or watch the boys. So, I sat as she manned the washing machine & dyer!! Thanks Peg! Your love of laundry is puzzling to me...but I appreciate! In the evening my mom returned the kiddos. I was so happy to see them! They seemed to have a great time and transitioned back home well! It even sounded as if they were good!!?? Thanks mom- I hate for you to have to make that drive, but appreciate your help! I went in today for a BP recheck with my family Dr. During my 2 hour visit my BP was up, down and all around each time they took it. She scheduled a sono of an artery for Wednesday and had me double my dosage of beta blocker. So, I officially feel old. 4 BP pills a day and 2 beta blockers, plus the iron supplement and about to finish the antibiotic from my cold. Am I 80? :) All this for the person who usually doesn't even like to take tylenol!! The Dr. had set an appt for me to see my OB in the afternoon. It meant taking the 2 boys, but I was willing to pay that price for a free day tomorrow. I couldn't have asked the boys to be better behaved! Even precious little Aidan wanted to "hold my hand" while the Dr. did her exam! He was so sweet! I think he could sense my nerves. Her final word on the bleeding/uterus issue...let's wait and see. Since my ER visit on Sat...and my requests for prayers from all you Friday night....my bleeding went from gushing when picking up baby to NOTHING on Sat. Answered prayer, coincidence, meds?!?! Hmmm.... Anyways the Dr. doesn't want to put me through a DNC unless absolutely necessary. So, we'll wait and hope it all stays away! What a relief. I feel I can now focus on the BP coming down to get this headache under control. Super excited that tomorrow I have NOTHING!! Yeah! Just my boys and at home. No Dr.! I thank you all for your prayers! Thank you to everyone who has watched or offered to watch the boys! I'm so looking forward to feeling recovered and spending good time with them! It's been very difficult for me to shuffle my 2 week old to so many different people! Isaac's been watched in 2 week by more people than Emma and Aidan in their first 6-12 months!! Our family has been surrounded by prayers, support and help from so many! I really feel undeserving of it all! I keep working on my thank you cards, then people keep helping thus I have to keep adding to their thank yous!! God Bless and love to you all! This is the message I first sent out on FB to some of my gal fam and friends requesting prayer and updating on the most recent events following Isaac's birth. I at first didn't feel it was for a blog...afterall some may not want all these details, but a friend changed my mind. I do hope to use online resources to have my blog printed and bound in a book at some point. Afterall it's like my journal. This friend mentioned that this should be recorded. Afterall, there may be a day where Emma is struggling as a mommy perhaps following a pregnancy and for her to know that even her mommy struggled may be great encouragement to her. It always seems as a child that our moms have it all together...SO here it is to have on the "record" for the future. Hello FB girls! I first apologize for how "impersonal" this message is, but time seems to be something I have little of these days and I really wanted to get this info out and simply don't have the time to make individual calls! I write to you because I'm needing some prayer and as I glance through my FB friends list I see I am wonderfully blessed with friends, family and members of my church body that will assist me. So many of you have been so kind, supportive and caring before, during and since Isaac's arrival and we are so appreciative and blessed to be surrounded by such a caring group! While at the Dr. I also mentioned that I'm experiencing more bleeding after this delivery than with the previous 2. I almost didn't mention it b/c I thought it might be from the BP, or the loss of blood I experienced after the birth OR caused by the strain due to the massive cough/chest congestion with the cold I currently have. I had contacted my OB's nurse today and she shrugged it off and said it could continue for 6 weeks. Well, I'm glad I mentioned it to my family Dr. today. Gals this is prime example on listening to your own body! The Dr. issued a sonogram of my uterus for right then. The radiologist read it immeditatly following the sono. I really thought it was probably a bit overboard and not necessary. Well...the sono shows I have pooling of the blood in the endometrium lining and uterus that is in excess of what I should have 2 weeks following giving birth. SO, they are scheduling me to see my OB on Monday or Tuesday of next week. They said it is a problem that will not fix itself and I will continue to bleed until it's fixed. The only way she really mentioned fixing it (although made it also sound like there's other ways) is a DNC. To be honest the whole idea of that a few weeks after giving birth is frightening to me, plus my sister has had one and had some significant complications so that futhers my fears. I also dread that each week of my maternity "break" from work is filled with Dr. appointments for either me or Isaac. He and I have been to the Dr. 6 times in the last 2 weeks!!! ugh!! And now perhaps a procedure in my future as well! My mom and dad met us tonight (Fri) to take the older two which is a huge blessing, yet floods me with emotions of guilt and sadness. There were several times after having Aidan and those complications that Emma was shipped here and there. I hoped and prayed this time would be different. I would "know" what I was doing, have a healthy happy baby and we'd enjoy 4-6 weeks at home. Yet all I feel I've done is ship the older 2 off here and there...sometimes overnight sometimes just for the evening. It tears me up. Poor Emma has been through so many changes the past few weeks. Her little emotions are out of wack right along with mommy's. Aidan has not handled Emma being at school very well. I do hope I'll be allowed some time of rest this weekend and I pray the older 2 have a great time with Mimi. It's interesting how things work. 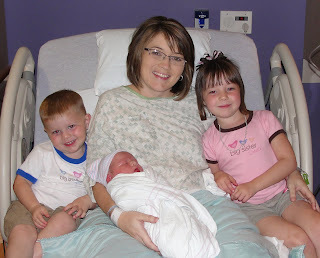 I remember after having Aidan that first night I told Matt how amazing it is that we were blessed with 2 healthy babies. Only then to struggle with minor medical issues and a very fussy Aidan for that first year. After Isaac's arrival we repeated those same words and I shared some of those feelings of amazement and blessings on my blog. And while Isaac is a very healthy little boy, it seems to be mommy's body struggling this time!! I'm trying so hard to focus beyond all my pains and yucky feelings to enjoy each moment of Isaac being tiny and balance time with the other 2, particularly Emma as she starts school. I don't want to dwell where my mind sometimes goes- when my head can take no more and all I hear is the throbbing feeling as though these precious moments are being stolen from me. Bleeding to stop, excess blood disappear! Our God CAN do that!! 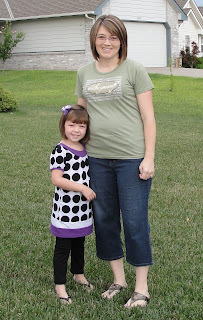 My attitude, patience and for peace- no more mommy guilt! And to find praise in this situation- even with all these things I am truly blessed. There are plenty of folks out there that have much more serious and major health issues than what I am experiencing. Congrats if you made it all the way through this!! Thank you girls!! Sorry for the rambling length of this, but I wanted to convey how appreciative I am of your calls, chats & visits of support you have given me, wanted to keep you all up to date and beg of your prayers!! Wow! So much can change in two weeks! It was 2 weeks ago I was at the hospital with visions of a baby by lunch time and an extended hospital stay to recover and rest. Ha! Silly me for having plans when it comes to children!! Have I learned nothing from the first two!!?? Our first week with Isaac was a blur as I look back now. It seemed in someways that we spent a week in the hospital...it felt as though lots of time went by. We got home from the hospital on Friday the 14th in the afternoon. My MIL had kept the children at our house since Thursday evening. Aidan was still napping and Emma excitedly greeted us in the drive. I loved seeing her- after all she greeted me by saying I looked "skinny". Pretty sure my wonderful MIL had coached her in saying this. (Remember her fascination with how quickly my big belly would go away...she had recommended weight loss drug Alli- gotta love an honest 5 yr old!) MIL got a few squishes in on Isaac and she was off for home. My SIL brought us dinner and our friends the Koosers offered to bring dessert! Yum! It was part way through the visit with the Koosers that I started dreading bedtime. Matt & I were both so tired and the kids were...um..NOT! Then a blessing from above...the Koosers offered to take the older 2 home for a sleep over!! Yeah! First night was semi restful. Isaac wasn't quite the sleeper he had been at the hospital. Saturday greeted us with more visitors. My mom, brother, sister and niece came down for the day to meet "Izzy" as my brother has nicknamed him. My SIL Mandy and her husband Chris also stopped by (it was Mandy's bday). They've been so close to our kiddos it was like old times having them come see Isaac. They also shared with us some of the most awesome news!!! Emma, Aidan and Isaac will have a new cousin in April! Yippie!!! My friend Karra, her 3 boys and husband also stopped in for an introduction to Isaac and left us some fabo cinnamon rolls. Sunday we were brave and ventured out to church. We had a new worship "guy" leading and were very interested to see what he had to offer. His name is Jared Bayless...sounds so much like Jeremy Camp!! Very, super talented!! (www.jaredbaylessmusic.com) It was great to introduce Isaac to people at church! We came home and enjoyed lunch courtesy of my in laws. Matt's fav- Bierocks. Pretty sure I napped away the afternoon! Monday was a "do-nuttin'" day. Took it easy. Isaac hasn't been sleeping as well as he had in the hospital. Has days and nights a bit messed up. He's up and discontent, but not super fussy. He's sleeping well from 2 p.m. - 10 p.m. then discontent from 10 p.m. until about 7 a.m. :) Scheduled Isaac's first appt. with the pediatrician. Tuesday my old daycare kiddo Shelby came to play. It was great! She entertained Emma and Aidan!! 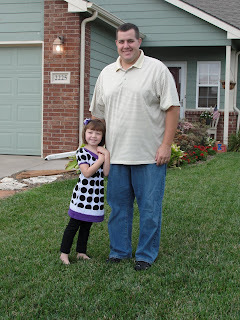 Emma had her Kindergarten testing in the late morning. Wednesday greeted me with a massive headache. I've been keeping tabs on my blood pressure after what I experienced post Aidan's delivery. It had been running 135/83 which is kinda high for me as my average is 90's/60's. I usually run low. My head throbbed and chest seemed to pound as I tried to nap. I did enjoy a wonderful nap b/c Matt took E & A to the zoo for the afternoon. Thank goodness! It had been so rainy in the past days and it cleared off just in time for an afternoon zoo trip! I did fell much better after my nap. Matt and I spent the evening dreading the morning. Emma's first day of Kind! Wow! So much change! She seemed excited! I had a sore throat as I went to bed- sad that the 1st week is over. Time just goes soooo quickly, Isaac will be 5 before I know it! Thursday AM up and running! All of us getting ready to get out the door by 7:45! What a trip! We delivered Emma to Kind. with no need for the Kleenex I packed in the diaper bag. Emma did as I expected...went in, got to work, and looked at me like "leave mom!". Friday and Emma is already "tired of this" referring to school! Oh wow! It's going to be a long 13+ years!! I woke feeling very, very yucky! Isaac woke at 5 am with snorty congestion and at 9 am with a crusty eye!! My plans were to go to Wichita Clinic Immed. care to get meds for my cold & congestion, but that would wait until Isaac was seen by his Dr. When I was checked in at the Dr. I noticed my blood pressure was even higher (150/101)...the Dr. confirmed & suggested I contact my OB. Long story short by night fall I was on high bp meds. It didn't get as high as with Aidan (180/120), but I had been keeping tabs on it as I noticed the unforgettable throbbing headaches I remembered from after Aidan so luckily we caught it sooner. Saturday was my first trial at being home with all 3 kiddos. Matt had to work at his company's annual golf tournament fundraiser. I wasn't alone for long. Friends Michelle & Wayne (&Brandon) came to play in the afternoon followed by Mimi & Papa. I probably wasn't the best hostess as sleep deprivation was in full swing & my cold was worse & had moved into my head/sinuses. Sunday Matt took the older 2 to church so I could get some rest. Then the in laws took Emma shopping, got Aidan down for a nap & ahhh nap for ME! Monday & Matt is back to work. Mixed emotions with that. It was great to have him here and have his help, but I could totally tell he was ready to return to work- and I'll leave it at that! :) I managed to get Emma to school on time, but before you're impressed with that know that Derby has late start Monday, so that gave us an extra hour!! Aidan, Isaac and I made a quick Walmart run and then took it easy for the day. Tuesday and Emma requests that school start in the afternoon so then she doesn't get so tired!! :) Oh, it's going to be a long year of school! Thanks to the blessing of my friend Audra Aidan stayed home & played with friends while I took Isaac in for his "boy" procedure. All went well and I'm so very happy that we are at the Dr. we are now!! We also did our 2 week check-up, which honestly I had forgot to schedule!! Isaac was 9lbs 13oz 21 1/2 in. Audra and I got some MOPS stuff planned out and had a great lunch. Isaac was a bit clingy all day and quite sleepy. Wednesday brings us to today and the 2 week mark! Wow! I forgot to take my meds last night before bed and I was sooooo regretting that by 5 am as my BP throbbing headache had returned with missing just one pill. I paid the price all day as my body didn't seem to catch up and the BP went right back up. Today was rough as Isaac was quite fussy and Aidan continues to be a handful that hasn't figured out his new role as big brother and how to fill his time with sister gone. In a previous blog I had mentioned (while in a positive mind set) that after surviving Aidan's first year and seeing how quickly it passed and how happy he is now, I could handle if this baby was like him. WELL, I must say that was all put to the test today. He would cry and cry, started spitting up, and seemed as though his tummy was hurting even though he's pooing good and very tooty. With my hormones & not feeling the best I was emotionally drained. Of course precious Isaac makes mommy look like a liar to daddy b/c by 5 pm he fell asleep and only woke to eat at 6:30 and 9!! We'll see what tonight goes like! I must say the one and only way we have survived these 2 weeks it by the prayer and support of family and those in our church family. We have been blessed with almost 2 weeks of meals brought in by friends in our church. Then there's those that have taken or offered to take the older 2 out for a play date to give me rest, babysat for appts., offered to get Emma to/from school, prayed for us or given nice gifts for little Isaac. I'm at a loss of what we'd do without the folks willing to be the hands & feet of Christ!! Drive to school! Wasn't it yesterday we were driving HER home from the hospital!! She chose for mommy to walk her in and Daddy pick her up. I think daddy was having the hardest time letting her go! Quick shot of her working. She did as I expected which was head to her desk and begin working all the while looking at me and a few of the other moms standing around like "why are you standing there. leave." I probably would have gotten emotional (did my share of that the day prior), but I was consoling my friend Anna who was dropping off her little girl, Emma's friend Avery (the blonde in the photo). I decided I best leave since there was no reason for me to continue standing around. You know a good reason like my child who will miss me dearly and therefore clinging to my leg begging me not to go. Nope. Not my Miss Independence! So here's the shot of the 2 who struggled most with the day! Luckily we had lots to keep us busy. Isaac had his first Dr. appt and then his first photo appt. A nice lunch sandwiched between the two appointments kept us from dwelling. Aidan on the other hand had an awful day. If a photo could have done justice of the fits he threw today I would have taken some, but video was the only way to get the real feel for how he felt about sissy being gone! Poor lil' guy has never been alone!! Isaac just isn't the entertainment he hoped for! I had told Emma she could pick what we had for dinner tonight since it was her special day. She chose "make your own pizza". The kids and I think even Matt enjoyed the making of dinner. Poor Isaac had been run ragged today! He slept through the prep and consumption of dinner! Which made the whole experience more enjoyable!! That's our day in a nutshell. Come next week I think I'll be quite relieved that Emma is gone. It'll guarantee me a nap each day as Aidan and Isaac are good afternoon nappers!! I do think it'll take a toll middle of next week on Emma. She has Thurs & Fri of this week to break her in. She was a bit frustrated that she couldn't remember her teachers name. I assured her that was ok since we didn't even find out who her teacher was until we walked in the door this AM! Mommy was frustrated by that too! She loved the school lunch today which was actually breakfast. She was super excited about little smokies!?!? She said her favorite part today was making the craft (a coloring booklet about the color red) and singing. I guess I hadn't mentioned that she would have music class. She was supppppper excited about that! I feel very blessed that she had a teacher that goes to our church and has 2 children from our church in her class. One thing I'm trying to be ok with (as a mommy) well make that two things. One, no nap. I know a nap time for the whole year is not necessary, but maybe a quiet time or something the first semester or even 9 weeks. Two, she is in a class in which the teachers job share. One teacher in the AM and a different in the PM. I know kids handle change well, but the consistency freak in me thinks that might be a bit much for Kindergartners. Here's some pics of the new Stout Sprout!! I'm posting these real quick and will share more news later, but I promised my princess & newest big sister I'd post some of the photos from yesterday so she could see them at Grandma’s house. So, here they are Emma! Remember Mommy & Daddy love you very much and are so happy to have your as our PRINCESS among Prince Aidan and Isaac! Whew. What a blur! And I don't mean the last few days. I'm thinking the last 9 months! I've done my best the last few days to make the most of my time as I know I'll get nothing but busier. Today the kids and I went to the dollar movie showing of Ice Age. It was a great experience to learn that Aidan is no where near ready for a theater movie! We grabbed a quick bite of lunch before they headed over to Aunt Shel's to swim while mommy caught lunch with a friend. This evening I took them to the in laws where they will be staying the next 2 nights. That wasn't easy. Monday we ran some errands, got the truck all cleaned out, and finished some sewing projects one of which was Emma's nap towel for school. I worked on getting the next 2 weeks outlined on a calendar with all her school events so we don't have any major first time Kindergarten parent oversights. As for me I'm feeling stuck. It's all so fuzzy to me. I went through this about 2 1/2 - 3 weeks ago and mentioned it to my Dr. I was just feeling non-excited. I was motivated to get lots done to prepare for baby, and maybe in all my prep started to forget what I was preparing for and to prepare myself?!?! This all contradicts a previous blog stating all the things I'm excited, nervous, etc about. I've tried analyzing if it's that it's the 3rd and I've been soooo busy with the others and everyday life that I'm not "connected" or is it that we didn't determine gender so it feels so different than with the other 2 that had names at 20 weeks!! After a long drive of constant questions from Emma I delivered them to my in laws tonight. Emma was quite emotional when I left, making it hard for me. She has seemed to piece together that there's going to be an "odd man out". She said "if I hold the baby so you can snuggle Aidan, who's going to snuggle me?" That ripped my heart out along side some county road we were driving down. I think for her it's the unknown. 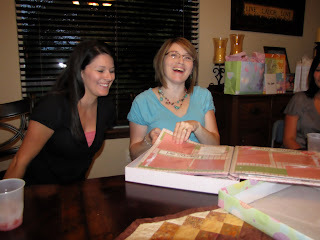 Once baby is here, gender determined, name, etc she'll wrap her mind around it all. Shoot...I'm hoping I can wrap MY mind around it all! Like mother like daughter! Then again I found it hard to reassure her with all her questions because I question myself on how it's all going to work out. Hard to answer her questions and make her feel safe about her place in out little family when I am full of doubts and concerns myself! But then as I reflect I have to know where these doubts come from!! I really feel like my emotions are being attacked and confused to distract from the miracle that is happening. The miracle that my 3 pregnanceis and 2 babies so far have been. I feel so blessed to be able to say I had no major or even minor complication during all of my 120 weeks of pregnancies!! Just think about how awesome the design of a developing baby, the way God made our bodies to adapt and endure the whole pregnancy and birth process! It's simply is so miraculous you can hardly get your mind around it!! I've been excited from the beginning to hold this baby! I know I'm capable as a mother to do the best I can...not always on my own and not always perfect, but with help from friends and guidance the ONE who created and designed each precious child for me! Well I bit the bullet. Threw caution to the wind. Pushed my nervousness and modesty aside. Tried my first attempt at making life "fair" & "even" for this 3rd child. Last Friday I was "Pampered" with a shower by some close friends at church. 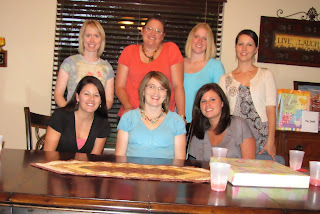 It's a busy time of the year so several gals were dearly missed, but the 7 of us that were there had a great time! Two of my fabo MOPS leaders Audra and Amanda G., 3 small group gals Amanda M., Kim & Lisa, and of course my only sis Marcia all blessed me with some goodies for the coming Stout Sprout. It was not an easy task I'm sure since we've been stubborn and do not know the gender!! Didn't stop my sister! She got me the cutest pink and brown onsies, a complete- fill in with pics- 12x12 scrapbook and a quilt in the softest of pinks and greens! She's very brave and apparently sure of this being a girl! The other ladies went together on some lotions & potions for me and a gift certificate to get my tootsies pampered and then for the Sprout a gift cards which will be super helpful to get a few items now and once we find out what this baby is! The shower was great fun! We all had so much fun chatting and were spared any corny shower games (hehehe Thanks Amanda!). It might go down as the latest baby shower on record, but get us all together and we can talk for hours! There was also awesome.delicious.totallyyummy food keeping us there! The best fresh fruit, queso dip, cake from Bagatelle (that was like our wedding cake), fresh raspberry lemonade, and oreo balls. Yes. Oreo Balls. Need I say more? Wish I had been on my game and took more pics!! So, a thanks to Amanda for hosting, the girls who were unable to attend but contributed and to the gals that were there!!! I'm so blessed! Your gifts are so appreciated, but even more is the blessing I feel to have you all to call friends. The gifts like a listening ear, an encouraging word or offer of support just when it's needed are priceless! I will be a better mommy to E & A and this new baby because of the love and support I gain from each of you! The adorable PINK scrapbook from my sister!